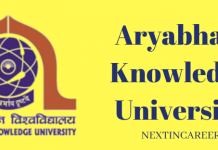 Dibrugarh University Admission 2019: Dibrugarh University has released its application form. Dibrugarh University is situated in Dibrugarh, Assam. The Dibrugarh University offers UG, PG and other courses to the aspirants. In order to provide admission in the courses provided, the university conducts an entrance examination. The candidates, who look forward to studying at Dibrugarh University will have to take an entrance examination. Clearing the entrance examination will only allow the one to take admission in the courses aspired. The candidates, wanting to sit in the entrance examination will have to fill in an application form which has been made available on the official website of the university. The candidates should note the fact that the application form will be submitted only when one pays the application fee. After that the aspirant has submitted the application form, the university will release the admit card. The candidates will be able to apply from the online form only. No aspirant will be able to apply offline. In order to apply, one will have to visit the official website of the university. The application fee will be paid through the online mode only. Post submitting the application form, one should be aware regarding the important dates of the events taking place after the submission of the application form. The official notification of Dibrugarh University will be released shortly. The candidates are advised to check the same by visiting the official website of the university. New: Dibrugarh University has released the application form on its official webiste. Click Here to fill the form. Must have a degree in Bachelors in any stream including Agriculture/ Engineering/ Technology/ Business/ Administration and Computer Application with a minimum of 45% from any recognized institute. Must be a graduate in any field with a minimum of 50% and a mandatory subject in graduation should be Mathematics in 12th standard. Must have a degree of LLB with at least 50% or must have pursued Bachelors of Arts/ Bachelors of Science/ Bachelors of Commerce/ BBA LLB recognized by UGC and BCI. Must have passed 12th standard with a minimum of 45%. The minimum passing percentage of 5% for reserved categories, SC/ST/OBC. Must have pursued a degree of Bachelors with a minimum of 45% in any stream from a recognized university. The relaxation for the reserved categories and differently abled will be 5%. Must have passed H.S. (Sc.) or equivalent examination with at least of 65% as well as 70% marks in between Physics and Mathematics. Must have a degree of Bachelors with a minimum of 45% from a recognized university. The relaxation for the reserved categories is 40%. The application forms for different subjects will behas been released on the official webiste of the university. The candidates will be able to fill the application form from the official website of the university. One can fill the application form from the online mode only. In order to be updated with the official notification of Dibrugarh University (which will be including the application form), one will have to keep visiting the official website of the university regularly. The procedure of filling the application form includes many steps which go like opening the prescribed website of the university, pushing the link of the application form, filling the form, paying the application fee and submitting it. The candidate should be utmost careful while filling in the details in the application form because if any particular is incorrectly provided, then the same will be mentioned in the upcoming documents and then it will be difficult or impossible to change them. This can create problems for the candidates. One should keep a note of the point that the application form will be submitted only when one pays the application fee. While providing in the details in the application form, the candidate should make sure that he/she is providing his/her own details, especially contact details. If the candidate should not have the mobile phone/ email id of his/her own, then the same can be provided of one’s parents. While uploading the documents, one should make sure that the same is of the prescribed size as per decided by the university. The university has decided a particular amount of fee which is to be paid by the candidate after he/she has submitted the application form. Any application form without the fee will not be accepted by the authorities. Dibrugarh University will be releasing the admit card of the entrance exams tentatively in the month of July 2019. The admit card will be available on the official website of the university. One can access his/her admit card from the online mode only. No one will be able to receive his/her admit card through post. The notification of Dibrugarh University will be released in the official website and the candidates are advised to take a look at the brochure regularly. It is mandatory for the candidate to bring the admit card to the prescribed examination centre. Not bringing the same will lead to prohibiting one from entering the examination hall. After one has downloaded the admit card, the candidate has to make sure that the details mentioned on the hall ticket are veracious as per one’s registration details. In case of any discrepancy, one must approach the examination authorities of the university. The Dibrugarh University Result 2019 will be released in the month of July 2019. The marks secured in the entrance exams will decide if the candidate can take admission in the subject he/she aspires for. The official notifications of Dibrugarh University will be released on its official website. To be updated, one is advised to keep visiting the website of the university and then taking his/her sight on the official brochure. One will have to login in order to gain his/her result. The details, being provided in the login section, will have to be correct. In case the login details are correct, one will be prohibited from accessing his/her result. The candidates, who have satisfied the necessary marks of the entrance examination will be able to attend the session of Interview/Group Discussion. The session of Interview/GD has to be attended by the candidates. In order to take admission in the aspired course, one has to qualify interview/GD.